North Carolina developed a dual military organization in 1861. The state “regular army” was to consist of ten regiments to defend the state: 8 infantry, 1 cavalry, and 1 artillery. The Volunteers were to be organized into separate regiments and mustered into Confederate service. The demands for manpower for the new Provisional Army of the Confederate States quickly ended this distinction and the State Troops were deployed to northern Virginia. During the mobilization of the state for war, the State Adjutant General, John F. Hoke, appointed a board of officers to develop a uniform for both the state troops and volunteers. This board developed a regulation uniform for state service by the end of May, 1861 and the governor approved it for use. These regulations prescribed gray as the basic color. The officers’ uniforms followed the basic U.S. Army types but the uniform for enlisted men was quite different. 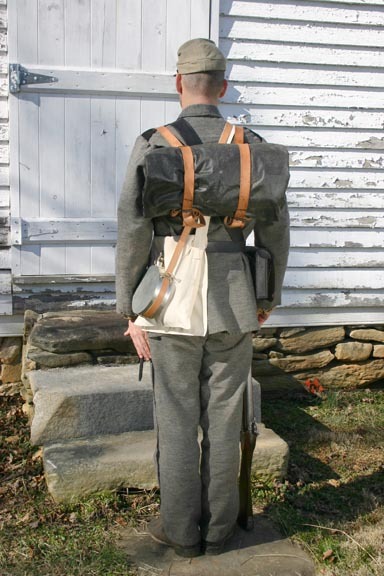 Enlisted men would wear a simple “sack coat” with shoulder straps provided in branch of service colors - black for infantry, red for artillery, and yellow for cavalry. 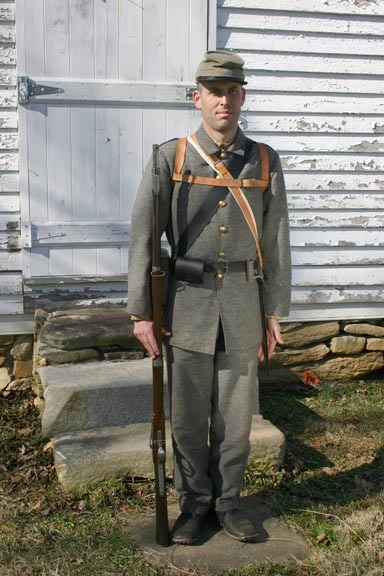 This infantryman is typical of the North Carolina soldiers from the summer of 1861 through the Seven Days Battles in 1862. He is armed with a percussion conversion of the Model 1816 musket, either taken from the Fayetteville Arsenal or a militia flintlock that the state had converted by gunsmiths in Raleigh and Fayetteville. His accouterments and other equipment were made in North Carolina by a variety of local contractors. He has rolled his blanket in an oilcloth and this is carried with “knapsack straps” in lieu of a knapsack.